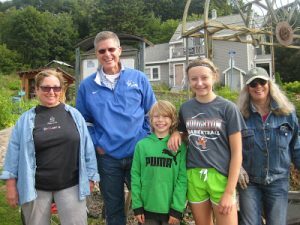 The Sustainable Finlandia Committee’s mission is to make our university a model institution of the Keweenaw Peninsula and the Great Lakes region. To achieve this mission, we will formulate guidelines for short and long-term practices and strategic goals. These guidelines will address academics, practices, values, and the community at large. In pursuing these goals, we will represent Finlandia University’s support of regional environmental stewardship and community economic reliance to maintain a sustainable Keweenaw. The spring collection will be May 4 and 5 at Goodwill at the airport. The collection site will be open on Friday, May 4 from 2 to 6 PM, and Saturday, May 5 from 10 to 2 PM. our new, Finlandia-Blue recycling containers. Instead of trashing your paper, plastic, or aluminum, recycle it! Place all appropriate, clean, and compacted materials in our new bins. 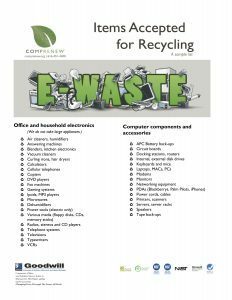 Confused about what can and can’t be recycled? Look around for brief lists of recyclable materials posted near these bins around campus. 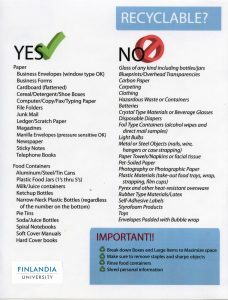 In addition to being good for the environment, recycling can help Finlandia University save money. The more clean, compacted recycling Finlandia produces, the less expense on trash. But we need your help. Inform your friends. Make smart choices. Recycling will pay dividends if we, as a community, all do our part. The Sustainable Keweenaw Resource Center (SKRC) and the Finlandia SustainabilityCommittee have launched a Battery Recycling program. 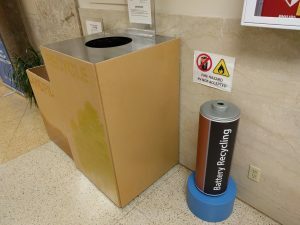 Battery Recycling bins have been placed at the following locations on campus: Finlandia Hall, Wargelin Hall (by the library), Mannerheim Hall (by the Registrar’s office), and the Jutila Center. Accepted batteries for recycling are AAA, AA, C, and D batteries. The bins were funded by the International School of Art and Design, designed by Rick Loduha with the help of Heather Dunne, and will be maintained by the Sustainability Committee. The Ryan Street Community Garden provides Hancock residents the opportunity to grow healthy, affordable, fresh vegetables, fruits, flowers and herbs for their households. 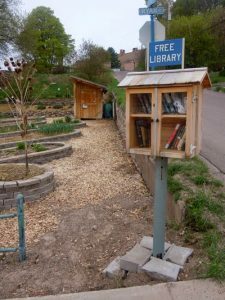 It also serves as a place for social interaction and creates a beautiful and educational landmark in the community demonstrating ecologically-sound and climate appropriate practices. 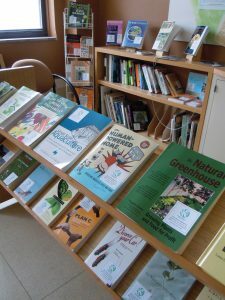 The SKRC provides the general public access to tools and resources for sustainable community development in the form of digital media and printed media.